A black and white negative of the Royal Hotel. 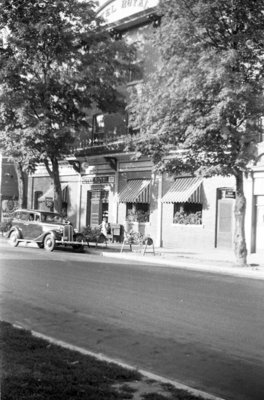 There is a car to the left of the photograph and a young child standing by the door to the hotel. The Royal Hotel was located at 171 Brock Street North. It was designed by Toronto architect Henry Langley and was built in 1873. Royal Hotel, c.1937, Marjorie Ruddy. Whitby Archives A2013_040_078B.